SMi reports: Senior military experts to discuss the latest developments in the USA SATCOM domain following the announcement of a $13 billion US Space Force at the MilSatCom USA conference in June. 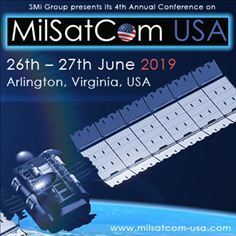 SMi's MilSatCom USA conference is making its highly-anticipated return to Arlington, VA on June 26th-27th 2019, as the leading event for U.S. government and industry experts, and international allies, focusing on military SATCOM. Last week, President Donald Trump signed Space Policy Directive-4 (SPD-4), calling for the Pentagon to create legislation to establish a new Space Force as the sixth branch of the United States military, alongside the Army, Navy, Air Force, Marines and Coast Guard. This year's 4th annual MilSatCom USA event will explore these latest developments in the US SATCOM domain during a two-day conference, with senior expert speakers set to discuss SATCOM and COCOM developments, as well as MilSatCom programme updates and future plans. Conference attendees will be at the forefront of key US Military space advancements, as a new 6th branch of the military ‘Space Command’ is developed. Attendees will also discover how the future US Space Force and other major policy changes are driving reformation of the US approach to military communications, as well as hear the valuable thoughts and perspectives of high-ranking military and industry leaders on how future SATCOM and C4ISR capabilities can be enhanced. The 2019 event will also explore MilSatCom programmes across allied partners and how this can promote collaboration and partnerships for future strategies. This year’s program features 16+ presentations, as well as 2 interactive panel discussions, delivered by senior military experts from across the branches of the US Armed Forces. Gold sponsor Airbus will be hosting an exclusive post-conference networking reception at the Hilton Arlington Virginia Hotel on 26th June. The evening reception will provide delegates with networking opportunities to foster new working relationships by engaging directly with both military and industry representatives. Places for the reception are limited, visit the website for more information at http://www.milsatcom-usa.com/vuelio or use the contact details below. Any commercial organisations who wish to attend the event should contact Alia Malick, Director by phone: +44 (0) 207 827 6168 or by email: amalick@smi-online.co.uk or submit a Sponsor Enquiry.